Louie Medwynter (stripes) in action for Peterborough Northern Star against Leicester Nirvana. Photo: Tim Gates. Peterborough Sports are just a one point away from securing promotion from United Counties Division One - and they have seven games in which to find it. 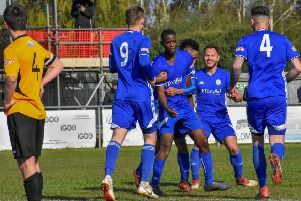 Sports’ 5-1 demolition of Wellingborough Whitworth yesterday (March 19) and a 2-1 defeat for second-placed Northampton Spencer at Potton moved them to the brink of a Premier Division place. They still need five points to seal the title. Kark Gibbs scored twice at Wellingborough with Dan Clements, Olly Medwynter and David Cobb also on target. Sports even scored the home side’s goal courtesy of Josh Moreman. Bourne remain fifth despite dropping two points at home to lowly Woodford United. The Wakes were in front inside the first minute through Jack Humphries, but couldn’t press home their early advantage before conceding a second-half equaliser. In-form Addie Staffieri scored again as Blackstones won 2-1 at next-to-bottom Bugbrooke St Michaels. Scott Ginty also netted for Stones who are closing in on the top half of the table. Holbeach United continue to do the best of the local sides in the Premier Division. They are fourth, a position they retained after a hard-fought 4-2 win over Cogenhoe at Carter’s Park. Second-half penalties from Andrew Tidswell and Josh Ford eased the Tigers to victory after the visitors had twice equalised following goals from Jake Clitheroe and Sean Coughlan. Wisbech won their game at Rothwell Corinthians 3-2 thanks to a last-minute strike from Adam Millson. The Fenmen had earlier thrown away a two-goal lead given to them by Billy Smith and Stuart Cobb. Yaxley got going too late and were beaten 3-2 at Desborough. Deadly duo Dan Cotton and Phil Stebbing scored in the final 10 minutes for ‘The Cuckoos’, while Deeping Rangers’ poor form continued with a 1-0 loss at third-placed Newport Pagnell. Leicester Nirvana moved back to the top of the table after cruising to a 4-1 success at Peterborough Northern Star. Craig Smith scored Star’s consolation goal in the final minute. Stamford AFC are back in the Evo Stik Premier Division relegation zone after they were held to a 0-0 draw at home by another struggling team Marine. Whitby Town sent ‘The Daniels’ into the bottom four by converting an 88th minute penalty. Spalding United are losing ground fast on the Division One South play-off places. They went down 2-0 at Kidsgrove. March Town United looked set to end a poor run of form and avenge a recent cup semi-final defeat in their Thurlow Nunn Division One game against Haverhill Borough before conceding an equaliser to a hotly-disputed late free kick. Ondre Odain had fired ‘The Hares’ in front in the seventh minute.